Harriet Jane Hanson Robinson (1825-1911) was born in Boston, one of 4 children of William and Harriet Hanson. When she was six years old, her father died. To support the children, her mother moved to Lowell, Massachusettes, to manage one of the boarding houses there operated for the girls who worked in the mills. When she was 10, Harriet began working in the mills intermittently from 1835 to 1848. She left at 23 to marry. "The first factory for the manufacture of cotton cloth in the United States was erected in Beverly, Mass., in 1787, and in 1790 Samuel Slater established the cotton industry in Pawtucket, R.I.; but the first real effort to establish the enterprise was in Lowell, where a large wooden building was erected at the Wamesit Falls, on the Concord River, in 1813. "The most prevailing incentive to labor was to secure the means of education for some male member of the family. To make a gentleman of a brother or a son, to give him a college education, was the dominant thought in the minds of a great many of the better class of mill­girls. I have known more than one to give every cent of her wages, month after month, to her brother, that he might get the education necessary to enter some profession. I have known a mother to work years in this way for her boy. I have known women to educate young men by their earnings, who were not sons or relatives. There are many men now living who were helped to an education by the wages of the early mill­girls. "It is well to digress here a little, and speak of the influence the possession of money had on the characters of some of these women. We can hardly realize what a change the cotton factory made in the status of the working women. Hitherto woman had always been a money saving rather than a money earning, member of the community. Her labor could command but small return. If she worked out as servant, or "help," her wages were from 50 cents to $1 .00 a week; or, if she went from house to house by the day to spin and weave, or do tailoress work, she could get but 75 cents a week and her meals. As teacher, her services were not in demand, and the arts, the professions, and even the trades and industries, were nearly all closed to her. "As late as 1840 there were only seven vocations outside the home into which the women of New England had entered. At this time woman had no property rights. A widow could be left without her share of her husband's (or the family) property, an " incumbrance" to his estate. A father could make his will without reference to his daughter's share of the inheritance. He usually left her a home on the farm as long as she remained single. A woman was not supposed to be capable of spending her own, or of using other people's money. In Massachusetts, before 1840, a woman could not, legally, be treasurer of her own sewing society, unless some man were responsible for her. The law took no cognizance of woman as a money­spender. She was a ward, an appendage, a relict. Thus it happened that if a woman did not choose to marry, or, when left a widow, to re­marry, she had no choice but to enter one of the few employments open to her, or to become a burden on the charity of some relative. "The life in the boarding-houses was very agreeable. These houses belonged to the corporation, and were usually kept by widows (mothers of mill-girls), who were often the friends and advisers of their boarders. "Each house was a village or community of itself. There fifty or sixty young women from different parts of New England met and lived together. When not at their work, by natural selection they sat in groups in their chambers, or in a corner of the large dining-room, busy at some agreeable employment; or they wrote letters, read, studied, or sewed, for, as a rule, they were their own seamstresses and dressmakers. "The boarding-houses were considered so attractive that strangers, by invitation, often came to look in upon them, and see for themselves how the mill-girls lived. Dickens, and his "American Notes," speaks with surprise of their home life. He says, "There is a piano in a great many of boardinghouses, and nearly all the young ladies sub- scribed to circulating libraries." There was a feeling of esprit de corps among these households; any advantage secured to one of the number was usually shared by others belonging to her set or group. Books were exchanged, letters from home were read, and "pieces," intended for the Improvement Circle, were presented for friendly criticism. "There was always a best room in the boarding-house, to entertain callers in; but if any of the girls had a regular gentleman caller, a special evening was set apart each week to receive him. This room was furnished with a carpet, sometimes with a piano, as Dickens says, and with the best furniture, including oftentimes the relics of household treasures left of the old-time gentility of the housemother. "This mutual acquaintanceship was of great advantage. They discussed the books they read, debated religious and social questions, compared their thoughts and experiences, and advised and helped one another. And so their mental growth went on, and they soon became educated far beyond what their mothers or their grandmothers could have been. The girls also stood by one another in the mills; when one wanted to be absent half a day, two or three others would tend an extra loom or frame apiece, so that the absent one might not lose her pay. 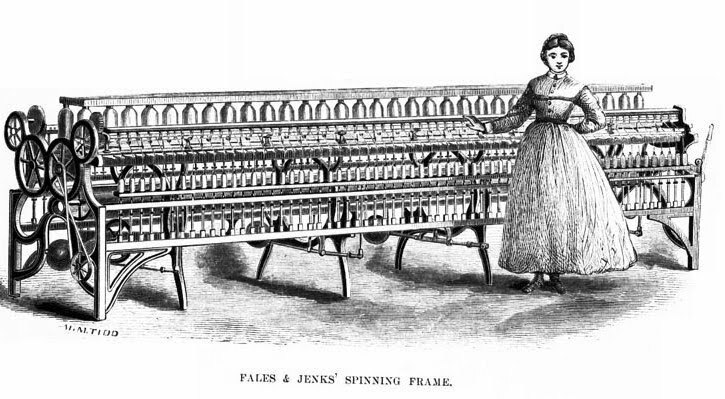 At this time the mule and spinning-jenny had not been introduced: two or three looms, or spinning-frames, were as much as one girl was required to tend, more than that being considered "double work." "The inmates of what may be called these literary house. holds were omnivorous readers of books, and were also subscribers to the few magazines and literary newspapers; and it was their habit, after reading their copies, to send them by mail or stage-coach to their widely scattered homes, where they were read all over a village or a neighborhood; and thus was current literature introduced into by and lonely places. "From an article in The Lowell Offering, ("Our Household," signed H.T.,) I am able to quote a sketch of one factory boarding-house interior. The author said, "In our house there are eleven boarders, and in all thirteen members of the family. I will class them according to their religious tenets as follows: Calvinist Baptist, Unitarian, Congregational, Catholic, Episcopalian, and Mormonite, one each; Universalist and Methodist, two each; Christian Baptist, three. Their reading is from the following sources: They receive regularly fifteen newspapers and periodicals; these are, the Boston Daily Times, the Herald of Freedom, the Signs of the Times, and the Christian Herald, two copies each; the Christian Register, Vox Populi, Literary Souvenir, Boston Pilot, Young Catholic's Friend, Star of Bethelehem, and The Lowell Offering, three copies each. A magazine, one copy. We also borrow regularly the Non-Resistant, the Liberator, the Lady's Book, the Ladies ' Pearl, and the Ladies' Companion. We have also in the house what perhaps cannot be found anywhere else in the city of Lowell,-a Mormon Bible." "Novels were not very popular with us, as we inclined more to historical writings and to poetry. But such books as "Charlotte Temple," "Eliza Wharton," "Maria Monk," "The Arabian Nights," "The Mysteries of Udolpho," "Abellino, the Bravo of Venice," or "The Castle of Otranto," were sometimes taken from the circulating library, read with delight, and secretly lent from one young girl to another. "Our religious reading was confined to the Bible, Baxter's "Saints' Rest," "The Pilgrim's Progress," "The Religious Courtship," "The Widow Directed," and Sunday-school books. "It was fortunate for us that we were obliged to read good books, such as histories, the English classics, and the very few American novels that were then in existence." Source: Harriet Jane Hanson Robinson. Loom and Spindle; or, Life among the Early Mill Girls. T. Y Crowell & Company, 1898.